Stinky tofu (Chinese: 臭豆腐; pinyin: chòudòufu), is a form of fermented tofu that has a strong odor. It is usually sold at night markets or roadside stands as a snack, or in lunch bars as a side dish, rather than in restaurants. Unlike cheese, stinky tofu fermentation does not have a fixed formula for starter bacteria; wide regional and individual variations exist in manufacturing and preparation. The traditional method of producing stinky tofu is to prepare a brine made from fermented milk, vegetables, and meat; the brine can also include dried shrimp, amaranth greens, mustard greens, bamboo shoots, and Chinese herbs. The brine fermentation can take as long as several months. Modern factories often use quicker methods to mass-produce stinky tofu. Fresh tofu is marinated in prepared brine for only a day or two, especially for fried or boiled cooking purposes. The process only adds odor to the marinated tofu instead of letting it ferment completely. Stinky tofu can be eaten cold, steamed, stewed, or, most commonly, deep-fried, and it is often accompanied by chili sauce. The color varies from the golden, fried Zhejiang-style to the black, typical of Hunan-style stinky tofu. From a distance, the odor of stinky tofu is said to resemble that of rotten garbage or smelly feet. Some people have compared it to the taste of blue cheese, while others have compared it to rotten meat. It is said that the more it smells, the better its flavor. According to folk stories, stinky tofu was invented by a person named Wang Zhi-He (王致和) during the Qing dynasty. However, there are different variations of the story. After failing the imperial examination, Wang Zhi-He stayed in Beijing and relied on selling tofu to make a living. One day, having a huge quantity of unsold tofu on his hands, he cut the tofu into small cubes and put them into an earthen jar. After several days, he opened up the jar and found out that the tofu had turned greenish and become extremely smelly. He tasted the “stinky greenish tofu” and found that it was surprisingly delicious. So he decided to sell that “stinky greenish tofu” as a commodity in his store. During the Kangxi period, Wang Zhi-He was a tofu seller as well as a pig feeder. One day he was making dried tofu with an earthen jar. After he put all the seasos in the jar, he was distracted by the pigs and forgot to put on the lid, and so the white paint on the wall kept falling into the jar. A while later, after Wang Zhi-He had settled down all the pigs, the dried tofu had already turned into dried stinky tofu. A 2012 chemical analysis found 39 volatile organic compounds that contributed to the unique smell and taste of fermented stinky tofu. The main volatile compound was indole, followed by dimethyl trisulfide, phenol, dimethyl disulfide and dimethyl tetrasulfide. Stinky tofu is made and consumed in different ways in various areas of China. For example, the types of dried stinky tofu made in Changsha and Shaoxing are made using different methods, and the resulting flavors are very different. Huo Gong Dian (a stinky tofu shop in Changsha) makes the tofu with yellow soybeans marinated in seasoning. The stinky tofu sold in Tianjin is made mostly in the Nanjing style, with a mild aroma. In Shanghai, stinky tofu is fried and sold on the street, typically served with a spicy or sweet sauce. It is also served as a condiment to congee, often as a part of a regular breakfast meal. In Chongqing, stinky tofu on the street is usually fried and dipped in a mixture of, typically, coriander (cilantro) leaves, scallions, chili powder, Sichuan pepper and oil. Stinky tofu is also sometimes dipped in Sichuan spicy hot pot. In Anhui, the deliciousness of stinky tofu depends mainly on its spiciness. The spicier it is, the more it suits the local favor. In Hong Kong, stinky tofu is a street food. It is deep-fried fresh at hawkers' stalls and at dai pai dongs and sold by the bag. Hong Kong-style stinky tofu is traditionally eaten with hoisin sauce. Unlike the diversity of stinky tofu in Taiwan, in Hong Kong it is usually deep-fried. Rather than eating deep-fried stinky tofu with pickled vegetables, Hongkongers usually enjoy deep-fried stinky tofu with sweet sauce and chili sauce. Stinky tofu is usually served deep-fried (often served drizzled with sauce and topped with sour pickled vegetables), grilled, or added to a Sichuan mala soup base (with solid goose blood, pickled mustard greens, and pork intestines). Deep fried stinky tofu is a common dish in both Taiwanese night markets and restaurants. Before the 1990s, hawkers even wandered around the street and peddled deep-fried stinky tofu. In Taiwan, people usually eat the deep-fried stinky tofu (often sold from carts) with the local sweet-and-sour pickled cabbage, rumored to relieve the greasiness. Spicy stinky tofu is a new cooking method for stinky tofu in Taiwan. Because of the prevalence of spicy hot pot, Taiwanese people came up with a new idea of forming a rich-flavored spicy hot pot soup base by using stinky tofu, duck blood and Chinese sauerkraut as ingredients. This innovative cooking method of stinky tofu is now popular in Taiwanese culture. 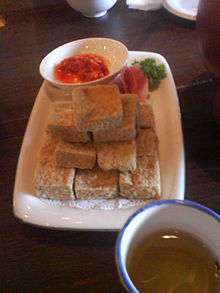 Soft Stinky tofu is commonly used as a condiment for rice, bread, congee or noodles. 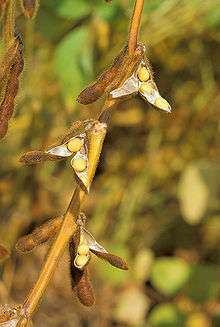 It can also be used as a seasoning for cooking. Barbecued stinky tofu is a popular stinky tofu variety believed to be from Taipei's Shenkeng District, and is served in many of Taiwan's night markets. Cubes of stinky tofu are speared on a bamboo skewer are roasted over charcoal with roasted meat sauce. Because of the huge amount of seasonings, the unpleasant odor of barbecued stinky tofu is comparatively weaker. Therefore, barbecued stinky tofu is always recommended for people trying stinky tofu for the first time. 1 2 3 Xiaomi, Tan (2 June 2006). "Stand back! Stinky tofu chain stores arrive in Shenzhen". Shenzhen Daily. ↑ Lennox, Craig (28 January 2010). "Chou doufu: the origins of stinky tofu". Global Times. Archived from the original on 30 April 2010. Retrieved 14 July 2010. ↑ "Wang Zhihe Fermented Bean Curd." Cultural China. Cultural China. Web. 21 May 2015. <http://kaleidoscope.cultural-china.com/en/8Kaleidoscope2094.html>. ↑ Liu, Y; Miao, Z; Guan, W; Sun, B (26 Mar 2012). "Analysis of Organic Volatile Flavor Compounds in Fermented Stinky Tofu Using SPME with Different Fiber Coatings". Molecules. 17 (4): 3708–3722. doi:10.3390/molecules17043708. ↑ "Yahoo雅虎香港". Yahoo雅虎香港. Retrieved 1 March 2015.